Right now, high-end throttle jockeys are rattling though the South American back country in overhauled machines designed for speed, volume, glamor and victory. 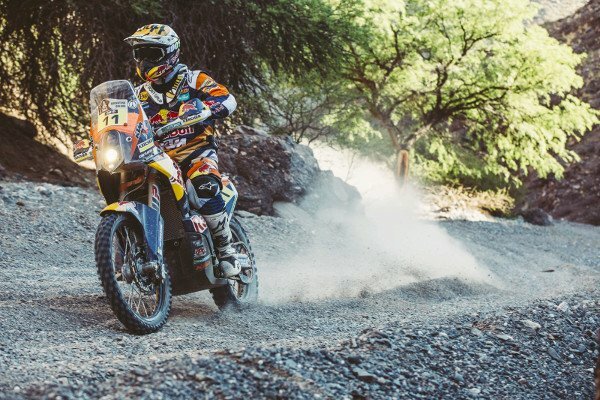 It’s a fine spectacle known as the 2016 Dakar Rally. AThe end of the first week of racing is always decisive. This year, all the drivers who have done their homework, trained well and remained faithful to their doctrines of mechanical prowess and situational awareness will come out on top. And there’s always the constant challenge of the elements to contend with as well as the variables of machine vs. man. Of course, we have multiple categories to enjoy in the Dakar. In the trucks category, as expected, Russia’s Eduard Nikolaev came out on top at the end of stage 7. It’s Nikolaev’s second stage win in this edition, and his ninth overall. With the motorcycles, race officials have deducted the time lost by Paulo Gonçalves when he rushed to Walkner’s aid after the Austrian fell. This means the official Honda rider finishing in third place, 3″ 9inches behind runner-up Kevin Benavides. The Portuguese racer expanded his overall lead to more than 3 minutes over Price. In cars, Nasser Al-Attiyah, driving his Mini, was 5 seconds faster than Stéphane Peterhansel and slipped in between the Peugeot drivers, thus preventing a new Peugeot 1-2-3. The defending champion lost over 3 minutes to Sainz, however. The Dakar Rally is like a dream: Aristocratic flair meets hard-won trail cred, with large purses and larger egos. It’s a spectacle to behold.